Personalised embroidered beautiful butterfly motif tea towel embroidered with a name or little message to make a truly special gift. Personalised embroidered beautiful butterfly motif tea towel embroidered with a name or little message to make a truly special gift. Unique and useful gift idea for a birthday, wedding anniversary or mothering sunday! Choose the Text. 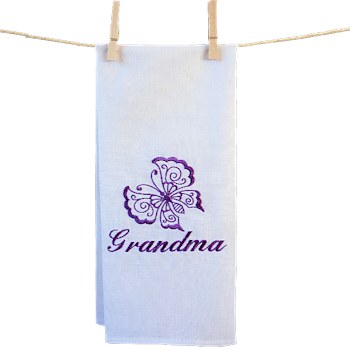 Personalised embroidered beautiful butterfly motif tea towel embroidered with a name or little message to make a truly special gift. Unique and useful gift idea for a birthday, wedding anniversary or mothering sunday! Choose the Text. Choose the thread colour and font style. We offer many thread colours including variegated thread, this beautiful thread changes from light to dark shades of colour and looks great for this butterfly motif! At Amys Gifts we do all our own embroidery work especially made to order and do our best to get most orders dispatched within 48 hours.